From the teaser on project runway touting the coolness of Ombre, to Guilana Rancic’s hair it seems that Ombre is everywhere you look. 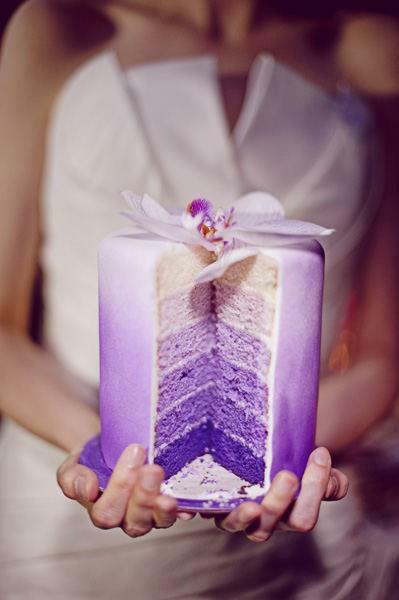 Ever since this photo showed up on pinterest, the blogosphere has become obsessed with Ombre Cake. They are everywhere. 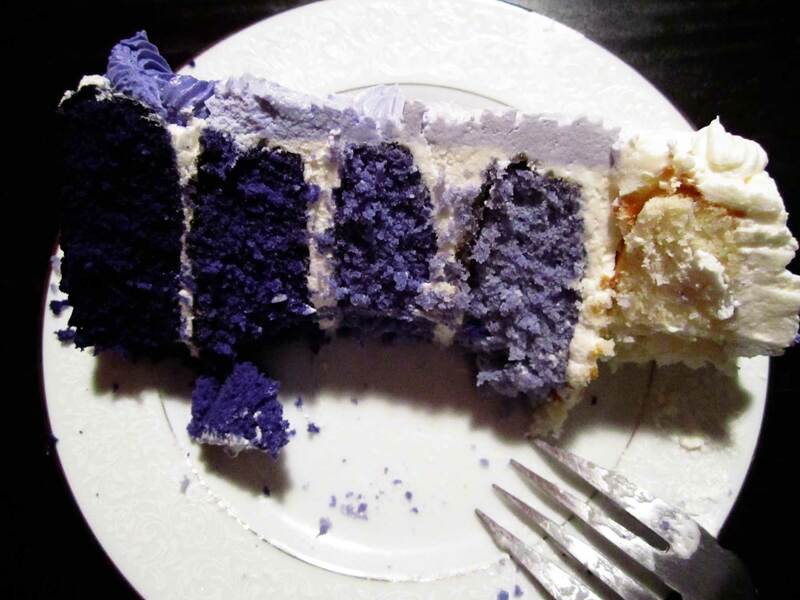 I decided to test the idea in my tiny kitchen for a friend who is in love with the color purple. It might be the perfect treat for her little one’s upcoming birthday…. 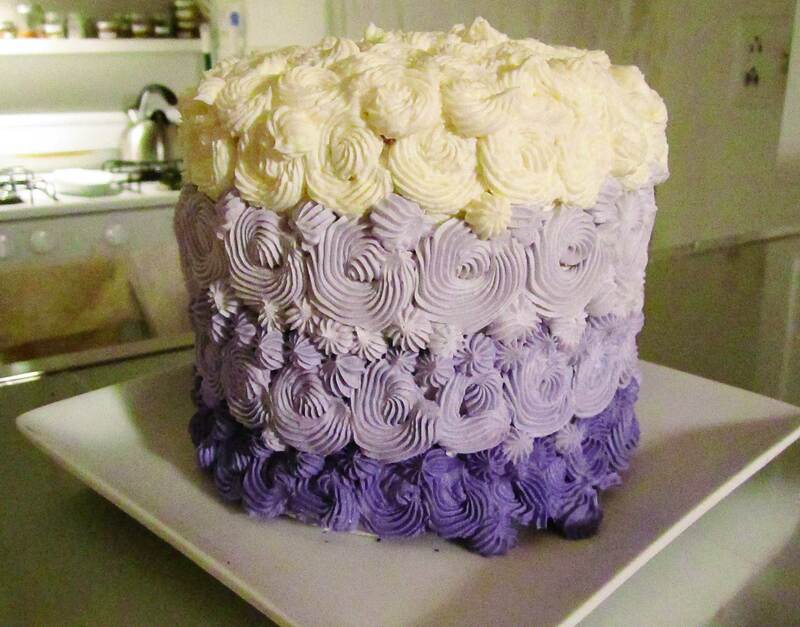 I only went for 5 layers as opposed to 6, and used the fail-proof Italian Meringue Buttercream for the frosting. 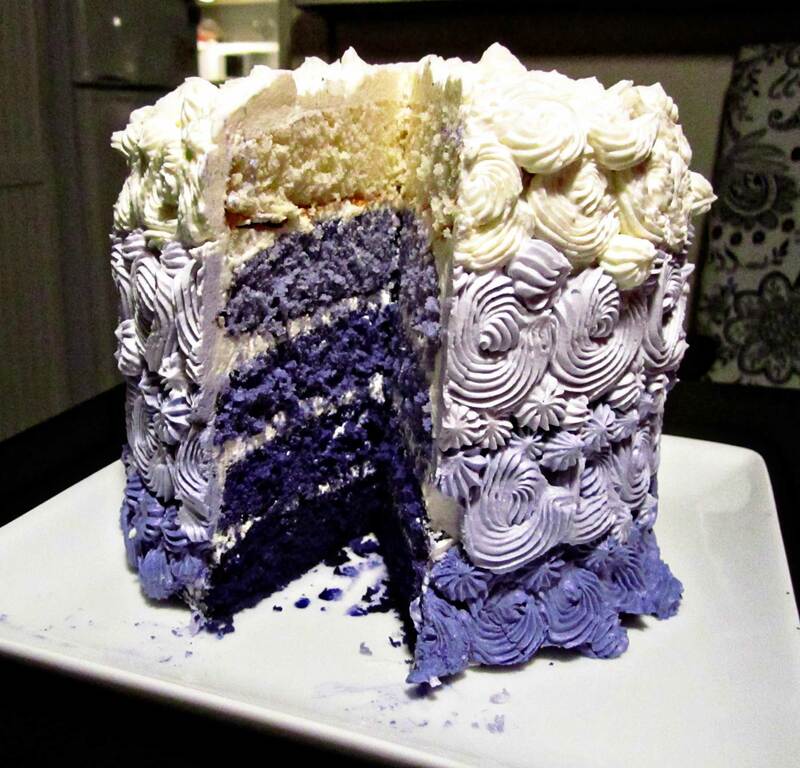 Wilton Violet Gel food coloring provided the necessary tint-age, for both the cake and the frosting. For $2.50 a bottle, of which I only used half, I’d say it’s definitely a worthwhile investment to add a little bling to a simple cake. It’s important to use a cake recipe that is pretty pure white so you don’t get a yellow cast to the cake that will mess with the coloring. I used a Betty Crocker recipe for Silver White Cake. The recipe calls for shortening instead of butter, but I only had butter flavored Crisco, which is yellow, rather than the white stuff. So when I make it again, I’ll be sure to use to classic Crisco, to get an even blanker canvas. NOTE: I used nice heavy cake pans to ensure even cooking, and lowered the oven temperature 25 degrees to ensure that the edges didn’t brown too much, which also fusses with the ombre effect. you can certainly saw off any browned parts, or cut your smaller cakes out of a larger sheet cake if you are so inclined. 1. Heat oven to 325 degrees (original recipe calls for 350). Grease and flour your cake pans. 2. Beat all ingredients except for the egg whites in a large bowl of an electric mixer on low speed for 30 seconds. Scraping bowl several times. Beat on high for 2 minutes, scraping bowl a few times. 3. Beat in egg whites on high for 2 minutes. Scrape bowl a couple times. 4. Separate into 5 equal portions (should be about a 1 1/4 cups in each bowl). Leave one bowl uncolored. In the next bowl, add just enough food color to tint your cake a pale shade, 1-2 toothpicks full ought to do it. Move onto the next bowl, adding slightly more coloring (4-5 toothpicks full, then 1/4 tsp, then 1/2 teaspoon worked for me). 5. Ensure that colors are very well mixed, to avoid a swirl effect. Bake for about 20-25 minutes, rotating once, until cakes pull away from the sides of the pan and a toothpick inserted in the center comes out clean. Cool in cake pans for 3 minutes, before inverting onto cooling racks. Design Sponge the digital magazine that I spend more time on than I should…. Future Architect Wicky Architecture, lifestyle, food, and design from my college roommate!